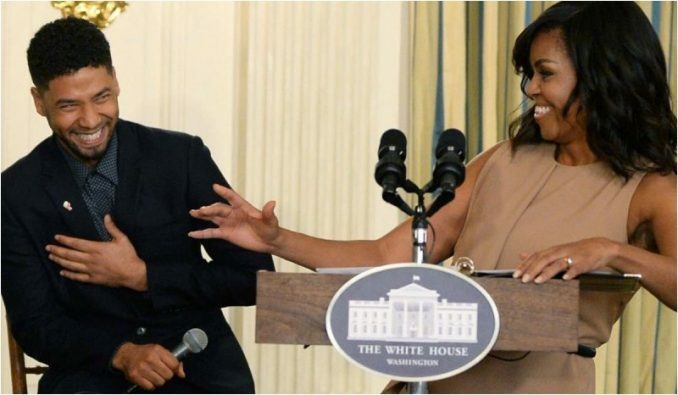 Last week it was reported that the Obamas were linked to the Jussie Smollett case when Michelle’s top aide interfered in the high-profile case. Now, shocking reports say the Chicago Police Department is demanding a federal investigation into the aide’s highly unusual actions to help the beleaguered actor. You don’t want to miss this. The Chicago Police Department couldn’t believe the audacity of Tina Tchen, Michelle Obama’s former chief of staff. It was just three days after Jussie Smollett claimed he was attacked by two men wearing MAGA hats when Tchen contacted Cook County Prosecutor Kim Foxx looking to influence the investigation. This was highly unusual. Tchen told Foxx, who would be the lead prosecutor, that the Smollett family didn’t want the Chicago Police Department in charge. Tchen advised Foxx to turn the case over to the FBI. According to text messages and phone calls reviewed by the Chicago Sun-Times between Tchen and Foxx, something really hinky was going on. “OMG this would be a huge victory,” the family member texted back. Now, why would the family say “this is a huge victory” if the FBI takes over? That’s exactly what the Chicago Police Department wants to know. The Chicago PD made Kim Foxx recuse herself from the case because of her contact with Tchen, and now they are demanding a federal investigation into the entire Tchen-Foxx debacle. “Chicago’s Fraternal Order of Police is officially requesting a federal investigation into whether the Cook County State’s Attorney, Kim Foxx, tried to interfere into the department’s investigation of Empire star Jussie Smollett on behalf of a former Obama administration official,” the Daily Wire reports. “Foxx recused herself late in the investigation, but only after she intervened in the case by asking Chicago Police Department Superintendent Eddie Johnson to turn the investigation over to the FBI at the request of a Smollett relative and a former Obama administration official, according to newly-released emails and text messages,” CWB Chicago reported. Well, Jussie Smollett was well-known to Barack and Michelle and had visited the White House on several occasions. What makes matters worse is that Michelle’s former chief of staff recommended the FBI take over. Potentially, the FBI would be much easier for the Obama machine to control. We all know how the Obama left-overs are still scattered in places of power at the FBI and DOJ. This is why the Smollett family member was celebrating the possibility of the FBI taking control. And this isn’t just a fluke. Obama’s aides meddling in racial issues, trying to whip up rage, seems to be a pattern. Last week, we have Roseanne Barr alleging it was the Obamas’ new Netflix partner, Channing Dungey, who fired her from ABC after she was contacted by Michelle Obama. Well, we really hope the Chicago Police Department hold the Feds feet to the fire on this one. The Obamas are ethics-challenged, and they have a propensity to interfere. One can only hope that more facts come out and we learn the truth. The pattern with the Obama flunkies still operating as if there were no end to the Obama presidency is getting really old, and Americans are sick and tired of the double system of justice: one for those in power, and one for the rest of us.